Trailer-Wheels.com Policies, Terms and Conditions Page. You have consented to receive documents, notices and other communications electronically about your TrailerWheels.com Online account. We may communicate with you, to the extent permitted by law, regarding any matter relating to TrailerWheels.com via electronic communications to you, including via electronic mail to the email address you provided for this purpose in connection with your Trailer-Wheels.com account, and/or via postings on the Trailer-Wheels.com website, including notices and other communications required to be provided in writing. All electronic communications from us to you are deemed to be communications "in writing" and are deemed to be delivered to you on the earlier of the date actually received or five days from the date of posting or dissemination. By using Trailer-Wheels.com, we are not obligated to provide any additional hard copy communications to you. It is your responsibility to ensure that you check your emails regularly for communications from us. You must ensure that emails from us are not blocked on your email account, and also that the email address you have provided to us remains current. In addition, you authorize us to act on any instructions which are provided by you to us electronically. 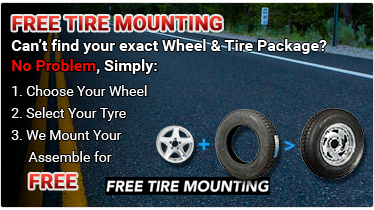 You can close yourTrailer-Wheels.com account by following the instructions in the Customer Support section of the Trailer-Wheels.com website. Once your account is closed you will no longer receive documents, notices and other communications electronically about your Trailer-Wheels.com account. We reserve the right, at our sole discretion, to change this Trailer-Wheels.com Electronic Communication Policy. We will provide you with notice of any such change as required by law. Unless otherwise specified, all materials appearing on this site, including the text, site design, logos, graphics, icons, and images, as well as the selection, assembly and arrangement thereof, are the sole property of this Store., Copyright 2006, ALL RIGHTS RESERVED. You may use the content of this site only for the purpose of shopping on this site or placing an order on this site and for no other purpose. No materials from this site may be copied, reproduced, modified, republished, uploaded, posted, transmitted, or distributed in any form or by any means without our prior written permission. All rights not expressly granted herein are reserved. Any unauthorized use of the materials appearing on this site may violate copyright, trademark and other applicable laws and could result in criminal or civil penalties. We accept the following credit cards: Visa, MasterCard, American and Discover. As well as Paypal, Paypal Credit, and Amazon Pay. There is no surcharge for using your credit card to make purchases. Please be sure to provide your exact billing address and telephone number (i.e. the address and phone number your credit card bank has on file for you). Incorrect information will cause a delay in processing your order. Your credit card will be billed upon shipment of your order. We accept money orders, cashiers checks, personal checks, and company checks in U.S. Dollars only. Orders are processed upon receipt of a money order or cashiers check. For personal and company checks, please allow up to 10 banking days after receipt for clearance of funds before the order is processed. We cannot guarantee the availability of a product by the time funds clear or payment is received. We will charge a $25 fee on all returned checks. Your receipt of an electronic or other form of order confirmation does not signify our acceptance of your order, nor does it constitute confirmation of our offer to sell. Trailer-Wheels.com reserves the right at any time after receipt of your order to accept or decline your order for any reason or to supply less than the quantity you ordered of any item. You may return your order provided all items are in new and unused condition within 60 days of purchase. We are not able to accept used items, or mounted wheels and tires for return. When returning an item, include a copy of the return authorization email you receive from our customer service team. All merchandise should be packaged securely so that it may be transported safely. We recommend shipping insurance for all returns. Shadow Industries is not responsible for any returned items damaged in shipping. When an item is returned and it shipped for free, the initial cost to ship the order will be deducted from the return. We will try to get your credit back to you as soon as possible, but please allow for up to 14 business days from date of cancellation or return for the credit to be returned to your account. Shipping and handling costs will be deducted from credit unless the return is the result of an error on our part. These Conditions will supersede any terms and/or conditions you include with any purchase order, regardless of whether Trailer-Wheels.com. signs them or not. We reserve the right to make changes to this site and these Conditions at any time. To keep you informed about our latest offers, we may notify you of current promotions, specials and new additions to the Trailer-Wheels.com site. You may unsubscribe from our newsletters by following the unsubscribe instructions in any email you receive from us. When entering any of our contests or prize drawings, you provide your name, email address and mailing address. If you win, we will send the prize to the address entered and notify you by email. When you enter a contest or drawing you are also included in our newsletter list to receive notice of promotions, specials and new additions to the Trailer-Wheels.com site. You may unsubscribe from this news list by following the unsubscribe instructions in any email received. We will gladly accept the return of products that are defective due to defects in manufacturing and/or workmanship for 30 days from the date of purchase given the product is in new and unused condition. Fulfillment mistakes that we make resulting in the shipment of incorrect product to you will also be accepted for return 30 days from the date of purchase. All items must be returned in new and unused condition to receive any refund in funds. Shipping Time -- Most orders received before 1:00PM will ship the same day, provided the product ordered is in stock. Most orders received after 1:00 PM will ship the next business day. Orders are not processed or shipped on Saturday or Sunday, except by prior arrangement. We cannot guarantee when an order will arrive. 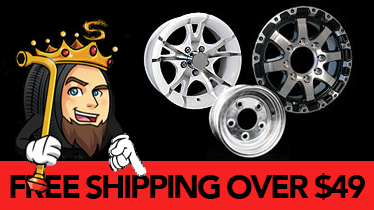 Consider any shipping or transit time offered to you by Trailer-Wheels.com or other parties only as an estimate. We encourage you to order in a timely fashion to avoid delays caused by shipping or product availability. Trailer-Wheels.com shall automatically charge and withhold the applicable sales tax for orders to be delivered to addresses within the same state. For orders shipped to other states, you are solely responsible for all sales taxes or other taxes.